It’s official, Marvel is bringing back its super popular San Diego Comic-Con Exclusive Skottie Young Marvel Character Pin Series! 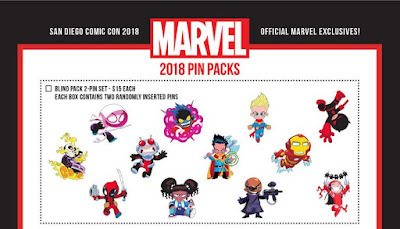 After a year hiatus – because Marvel thought it would be fun to release Super Hero Emoji pins instead – we’re getting a fourth series of these epic Skottie Young Marvel Character Pins. Every year these limited edition enamel pins are some of the hottest, most sought after exclusives at SDCC, and The Blot is anticipating high demand for these fantastic Marvel pins yet again. The San Diego Comic-Con 2018 Exclusive Skottie Young Marvel Pin Series includes four 4 packs ($25 each): Fantastic Four (Mr. Fantastic, Invisible Woman, The Thing, Human Torch); X-Men (Wolverine, Storm, Ice Man, Cyclops); Avengers (Thor, Captain America, Wasp, Black Panther); and Villains (MODOK, Magneto, Doctor Doom, Venom). The following characters are only available in Blind Bag 2 Pin Sets ($15 each): Ghost Rider, Spider-Gwen, Deadpool, Ant-Man, America Chavez, Nightcrawler, Doctor Strange, Captain Marvel, Nick Fury, Iron Man, Daredevil and Elektra. 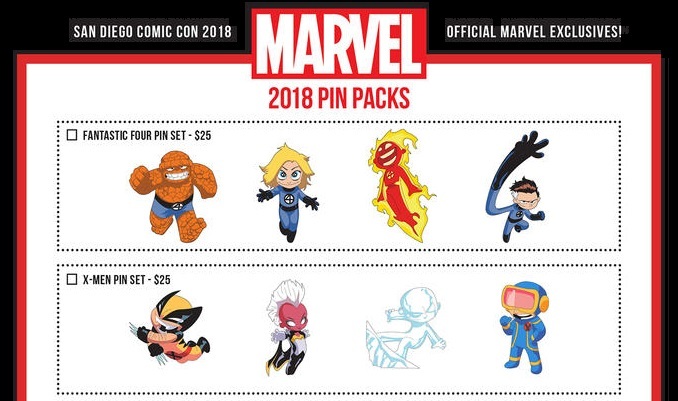 The Silver Surfer and Galactus, Thanos, and Ms Marvel and Lockjaw Pins will be sold individually, but you must spend a certain amount of money at the Marvel SDCC booth for the opportunity to add one to your order. There’s also a really cool Spider-Man pin that will only be available as part of a lanyard set.